After finishing my vest, I started the Roll Edge Cardigan, a new pattern from Knit Picks. I’m using size 6 needles and Sundara sock in Bluebells, and since the pattern calls for worsted weight I’m holding the yarn double. I’ve finished the sleeves and yesterday I started on the body. I like to think of myself as go with the flow and calm, but in reality I’ve got more than a dash of type A. When I go somewhere I have to be early. If I go on vacation I plan everything in advance. The same goes for my knitting. I cannot have more than one project on the needles at once, which usually works well. My projects go quickly, I’m focused on what I’m doing, I don’t have the problem like some knitters do where they put down their project for a couple weeks and can’t remember where they were when they pick it back up again. That being said, I want to cast on for another project and give this one a rest so bad. This sweater is going to take for-freaking-ever. You knit the sleeves first, then cast on for both the back and front. 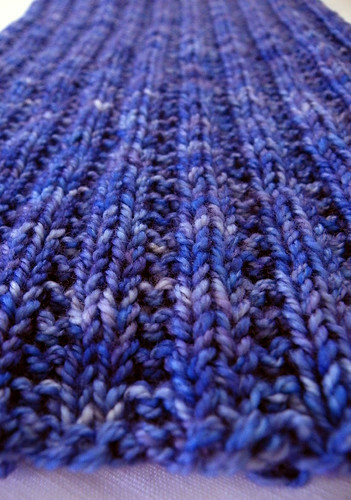 When I swatched for the pattern I didn’t like the gauge, so I changed it from 18 sts = 4″ to 20 sts = 4″. This change means I have to knit the sweater at the largest size, and doing two rows (of 228 stitches each) takes about 30 minutes. And to get the lower body the length I want it to be it will take me about 33 hours of knitting. I’m trying to remember that I’m knitting the front and the back at the same time so I’ll have quite a lot of the sweater done when I finish the 132 rows it’s going to take. But when I’m in the middle of an endless k2, p2 row it’s hard to not want to knit something else. I know I’m going to love this cardigan. 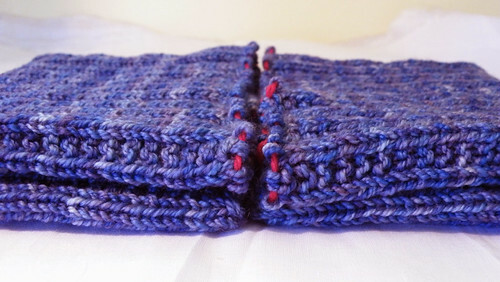 I know it will be the perfect summer cardigan for cool mornings and nights. But it’s going to take a lot of relatively boring knitting to get there. So let’s talk about something that makes me happy. I came home from work last week to find a very large box in my living room. And I mean large – it came up to past my waist. My husband was giving me the evil eye like ‘what did you order now?’ but this time I was completely innocent. Inside was this lovely little stand. It was an early birthday present from my Aunt Judi, and it means the world to me. It belonged to my Grandma, who passed away before I was born. You know those silly hypothetical questions people ask, like if you could have lunch with anyone living or dead, who would it be? My answer is always my Grandma. I feel shorted for many reasons that I didn’t get to know her, among them that she is the only other knitter in my family, and I would give anything to have learned from her. As far as I know none of her knitting has survived. My Grandma used it to store her needlepoint, and my Aunt Judi felt that as the crafty person in the family it should belong to me. 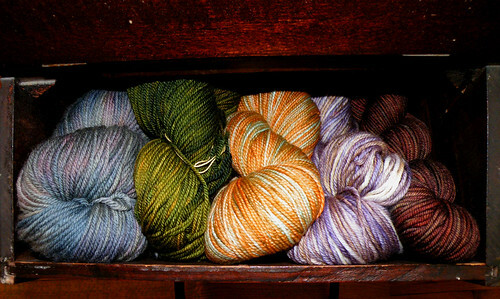 She reads my blog, and just so she knows it is now home to 11 skeins of yarn. She was afraid I wouldn’t be able to fit much into it. She underestimates knitters and their abilities to cram yarn into every available inch of space. Your grandma would be so pleased that you have this. It has a good home. Aunt Judi used to knit a long time ago. She made a beautiful red and white sweater for CeCe when she was 2 or 3 years old. You know the kind with the reindeer and cool metal buttons – wish I still had that too. Your Aunt Sue used to knit also. My answer is the same: Grandma. Oh god, I love that sweater. I fell in love with it the moment I saw it in the Knitpicks catalogue. I think it’ll turn out great once you get it finished. That chest is also absolutely adorable. Perfect for yarn! Don’t you love hand-me-downs? 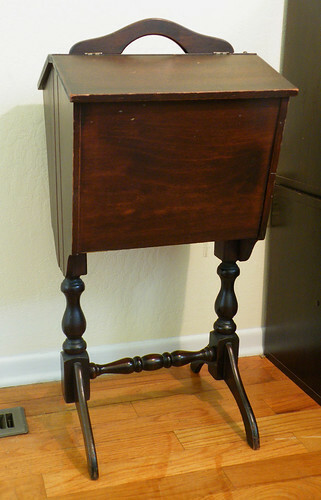 The stand is gorgeous, and I’m happy you have it as both a memory of your grandmother and a token of a craft you both love.